Donovan's sets the standard of steakhouse excellence. 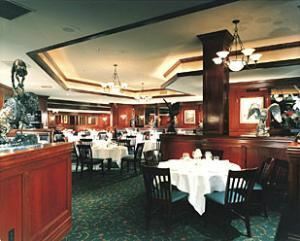 Donovan's Steak & Chop House offers VIP treatment with complimentary valet parking and greeting by a host staff that shares a commitment to dining pleasure. The cocktail and wine bar features a personable bar staff that specializes in generous pours, oversized cocktails, delectable wine selections and complimentary prime filet mignon mini-sandwiches served from 4:00 to 6:00 pm. Each of well-appointed dining rooms presents a unique environment complementing to the size of your group. Broadband Internet access is standard. Many of the meeting rooms are configured with built-in projection screens and audiovisual components are available to enhance presentations and guest interaction. The California Room is the favorite room of many of our clients. The mahogany paneling, generous width, and quiet location of this room make it one of the most desirable private rooms at Donovan's. Our largest private dining room is nearest the main bar. The Del Mar Room is adorned with mahogany-framed photos of famous thoroughbred champions autographed by the jockeys that rode them to victory. Environment of nostalgic and antique photos of Old San Diego and La Jolla. The Sports Room is elevated and off the main dining room. Surround your guests with classic memorabilia, paintings and photos of great athletes. A private cul de sac at the back of the main dining room surrounded by three walls and a a double-thickness theatre curtain. The Gallery provides a visually private area for you and your guests. Not appropriate for AV presentations. The décor is evidenced by its name and framed vintage currency. The Wall Street Room is our smallest private dining room. A working wine cellar surrounds your guests with the world's finest wines. Our staff periodically, yet unobtrusively, enters the room to gather wines for other diners. The Wine Cellar is one of our most impressive and popular rooms. Special Features: Donovan's sets the standard of steakhouse excellence. An appealing atmosphere of rich mahogany, eye-catching paintings and bronze sculptures artfully bathed in soft flattering light. Upscale and worldclass yet cordially friendly.